There are a seemingly endless number of ways to represent colors. Whether you’re a professional designer or developer, or someone who just wants to update a website template, you’ve undoubtedly come across several. The trouble with so many different formats is that it guarantees that at some point, the color value you have won’t be the one you require. Aquarelo is a beautifully-designed new Mac app that cuts through the thicket of formats to help you find the colors you want and convert them to the format you need. Many of the color utilities I’ve used in the past on the Mac and iOS have been abandoned, so it was good to see a new one released that’s as polished as Aquarelo. The main UI resembles a swatch of colors with a couple of additional controls. There are two text fields for entering color information and a stepper control in the center of the window for indicating how many colors you want to create. Type an RGB or HEX value or color name into each text field, and Aquarelo generates a range of colors between the two you entered. 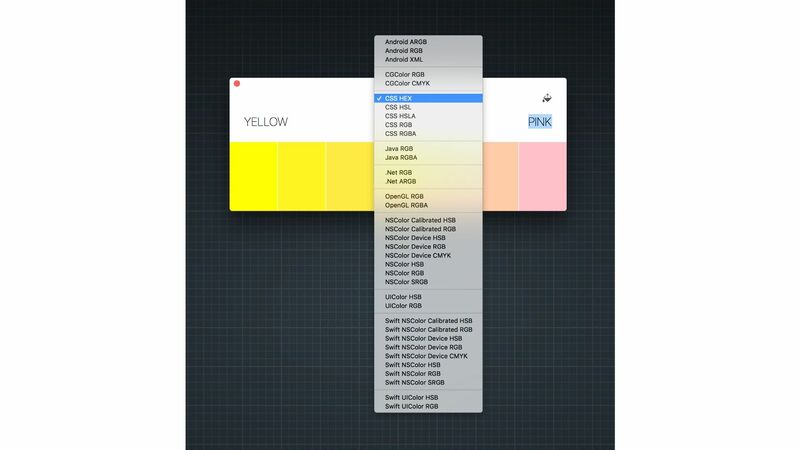 You can even drag a color into the app from the system color picker. One small quibble I have with dragging colors into Aquarelo is that you can only drag them onto the text fields in the app. I think it would feel more natural to drop colors onto the endpoint colors in instead. I particularly like that Aquarelo allows for adding colors by name using terms like ‘neon green,’ ‘dark brown,’ or ‘pale pink.’ It’s a delightful touch that feels a little magical and simultaneously removes the friction of getting started for anyone who isn’t a color expert. It would be nice, however, to be able to adjust endpoint colors with a color wheel or some other mechanism when the color described isn’t quite what I intended. Another area in which Aquarelo shines is exporting color values. At the top of the center of the window, you can pick one of 36 export formats. Clicking on any of the colors in your swatch copies the color in that format to the clipboard for pasting wherever you need it. There’s also a button for exporting the entire swatch of colors in one of 11 different formats. Additional options are available by right-clicking on a color. Picking ‘color details’ from the contextual menu opens a card for that color that includes its name, HEX and RGB values, an export button, and buttons to send the color to Adobe’s Photoshop and Illustrator apps. A Sketch plugin and a PopClip extension that let you send HEX values to Aquarelo from those apps are available on the Aquarelo website as separate downloads. Aquarelo's contextual Touch Bar support. Aquarelo supports the Touch Bar too. With a series of colors displayed, you can tap a color on the Touch Bar to copy its value to the clipboard. If a single color window is open, the Touch Bar’s colors are replaced with shortcuts to copy the RGB or HEX values, send the values to Photoshop or Illustrator, or export the color value in another format. There are a couple of features I’d like to see added to Aquarelo to round it out. 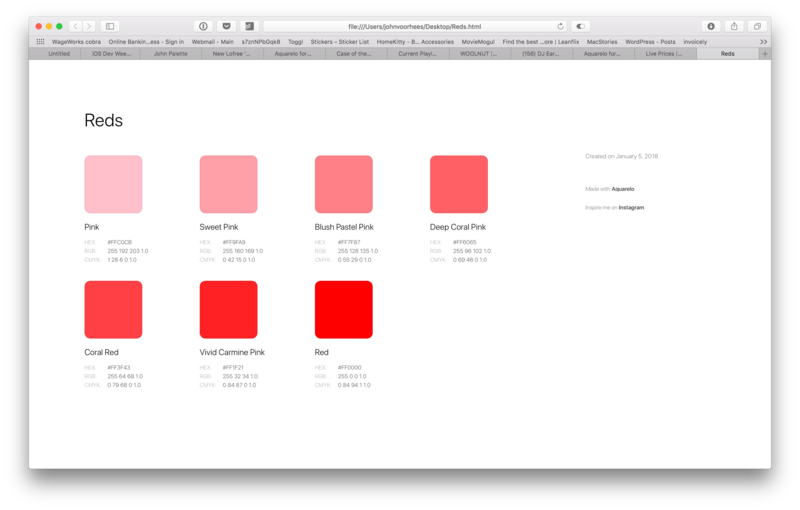 The first is the ability to save color swatches. You can export a series of colors as HTML, which creates a web page of your colors that will open them in Aquarelo with a click. However, I’d also like to be able to save a swatch with a name and drop it in a folder with other project files, so I can just open it up again in Aquarelo without recreating it from an HTML file. Colors can be exported as HTML. I would also like to see Aquarelo integrated with the system share sheet so I can quickly send a color swatch to someone as an image. The existing export options are excellent, but sometimes a simple image file sent in Messages is all I need to get someone’s thoughts on a color scheme. If you work with colors, Aquarelo is an excellent addition to your set of tools. The wide array of export options make it a good choice for developers and designers and provides flexibility for sharing color choices with colleagues in whatever format they prefer. There are a couple of features I’d like to see added to Aquarelo, but none are deal-breakers. I look forward to seeing where developer Giovanni Cusaro takes the app next. Aquarelo is available on the Mac App Store.